Is your WordPress website still not showing a green padlock even after installing SSL certificates? Don’t panic – there’s usually an easy fix! NOTE: This tutorial applies to both the Bitnami and Click-to-Deploy configurations of WordPress on Google Cloud. In this tutorial you will learn about the most common reasons why your SSL certificates aren’t working properly, and how to fix them! Before getting started with this tutorial, you should have already completed an SSL certificate tutorial. If your webpages aren’t loading securely after installing SSL certificates, it may be due to mixed content errors. 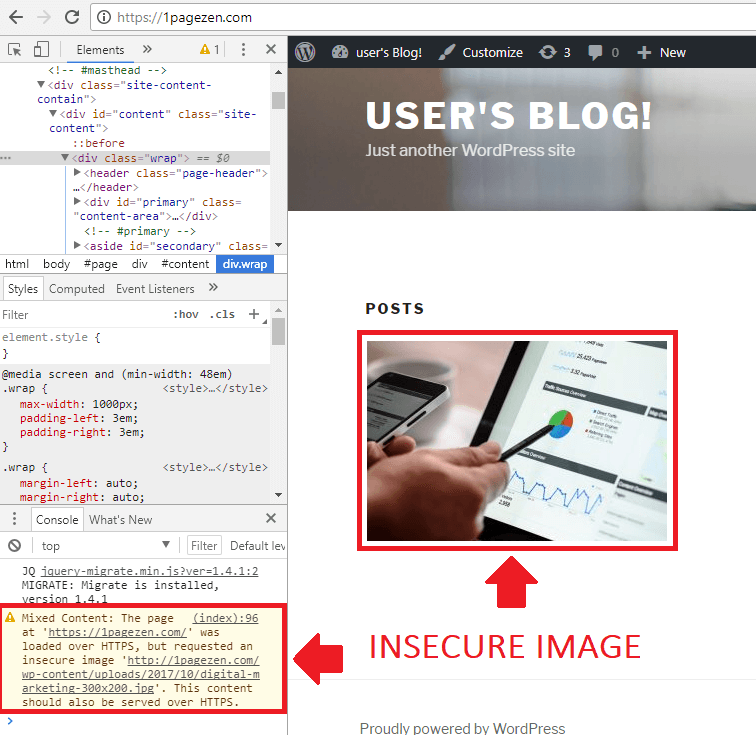 If your website is loading with https:// but with an symbol instead of a symbol, it may indicate a mixed content error (as seen in pictures below). The first step is to open your developer tools by right-clicking anywhere in the body of your webpage and choosing inspect. Now that you’ve opened your developer tools window, the next step is to look for alert messages under the console tab at the bottom of the window and identify errors that say Mixed Content. Next, click the select an element icon at the top-left of the inspect window, then click on the image on your webpage. Check to see if the URL (filepath) of the image on your webpage matches the URL (filepath) of the image that is causing the mixed content error. The next step is to locate where the image file is embedded. 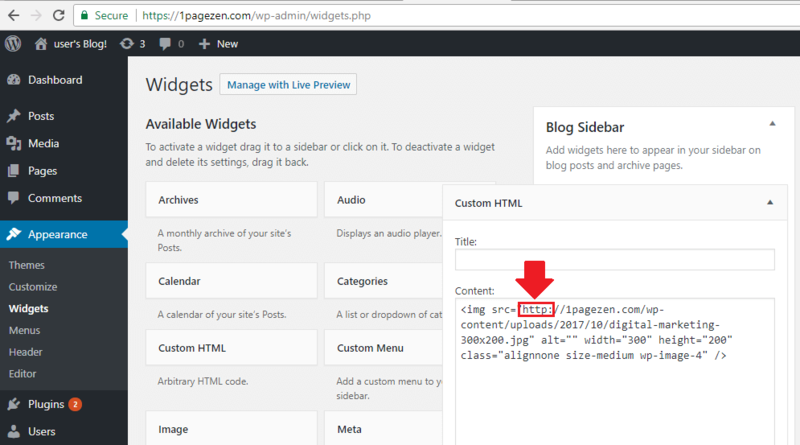 Images are usually embedded in either the posts, pages, or widgets section of your WordPress website. In this example, the image was embedded as an HTML widget. The next step is to simply change the http in the file path to https. In both the Bitnami and Click-to-Deploy SSL certificate tutorials for WordPress, you are given a series of commands that you can copy and paste into your SSH terminal window. However, many users forget to make alterations to the commands in order to reflect their own domain names. 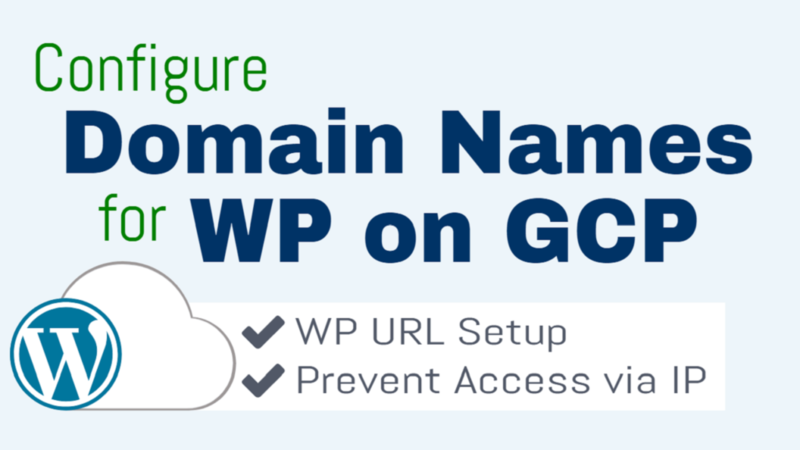 Before getting started with either the Bitnami or Click-to-Deploy SSL tutorials, you need to have already completed a tutorial to Deploy WordPress on Google Cloud and Configure a Domain Name on Google Cloud. The SSL tutorials are configured based on the WordPress and DNS tutorials below. For this reason, make sure your WordPress and DNS configurations are at the very least similar to the configurations demonstrated in the tutorials below. 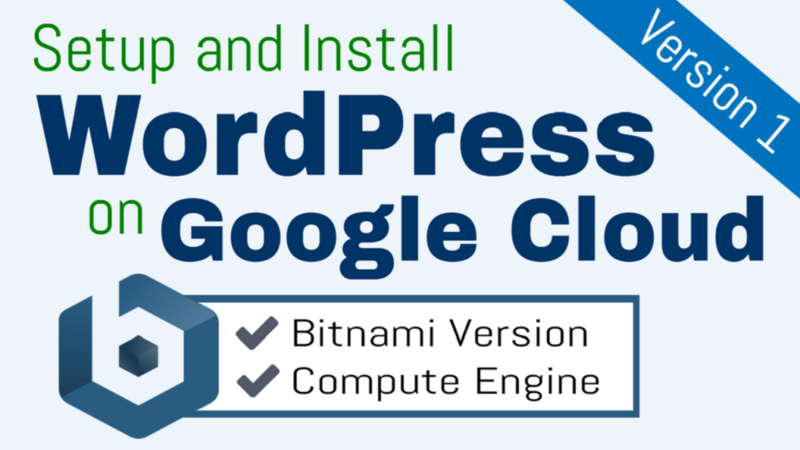 Click here to learn about the differences between the Bitnami and Click-to-Deploy versions of WordPress on Google Cloud. Were you able to fix an existing problem with your SSL certificates? Kindly support to rectify this as i am clueless on what to do. This generally means the certificate was configured incorrectly. In this case, I would recommend going through the tutorial (and comments section) and check for any things you may have missed. 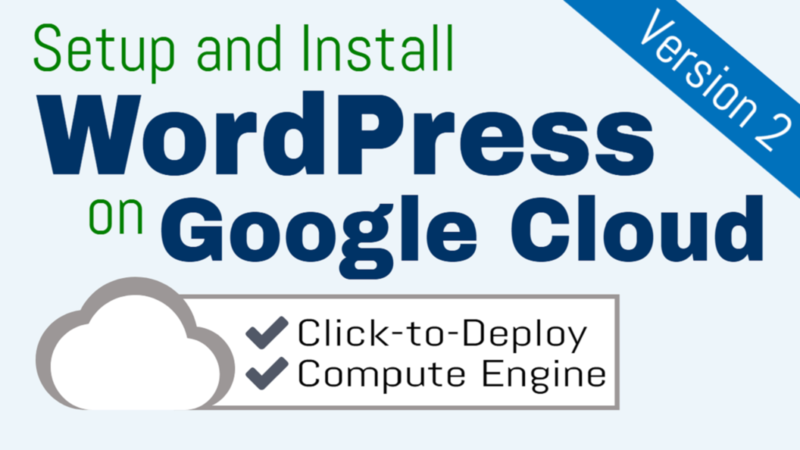 Make sure that you’re using the Click-to-deploy version of WordPress on Google Cloud. If you’re using the Bitnami version of WordPress on Google Cloud, the webroot will be different from /var/www/html. If you’re using neither Bitnami or Click-to-deploy, it’s possible your webroot is completely different from either of the two. To investigate further as to whether /var/www/html/ exists, you can run the following command in the terminal to change directories and get an understanding of your application’s directory structure. Hi, I’m trying to install an ssl certificate, but I get an error. I have installed wordpress multisite for deploy. Can you help me. Please provide details of the error. 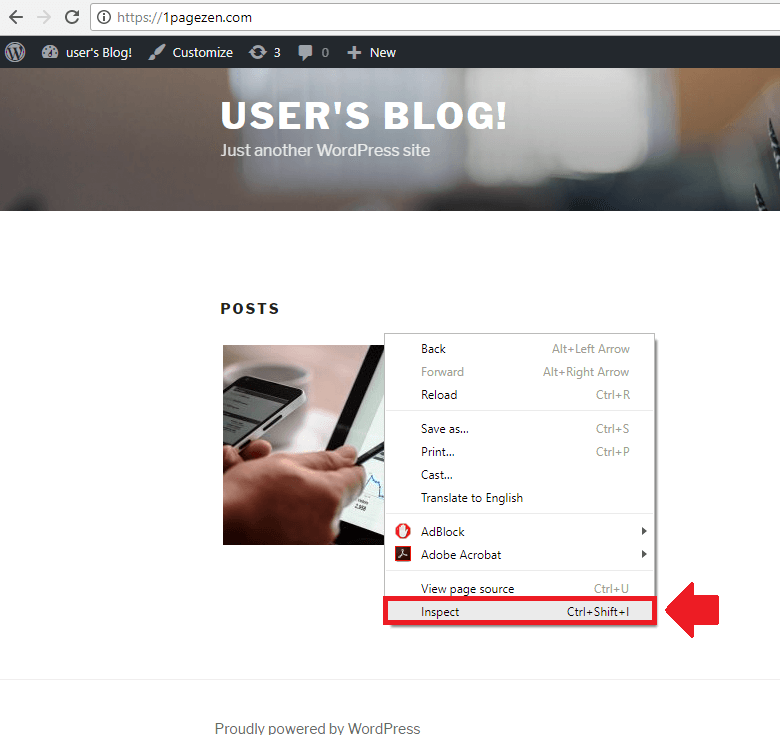 Also, feel free to post the question in the WordPress Cloud Hosting Support Group for a faster response. I am not getting lock icon after installing wordpress theme , previous i am getting , Also not getting inspect bottom . Check your domain with SSL Shopper to verify that server is displaying the correct certificates. Also, I am not sure what you mean by ‘Also not getting inspect bottom’. Thanks working , in safari not getting inspect when Right Clik to find mixed content error , I used google chrome . Pleas help on expiry of SSL . Showing expire in six month so this will renew auto or need to renew again . Why will be process . You first have to enable the Safari develop menu. After it’s enabled, you can right-click anywhere on the page and select ‘Inspect element’ in order to toggle the inspect window. If you think you will be doing a lot of development in the near future, I’d recommend switching to either Firefox or Chrome, as they both have a more advanced ‘developer tools’ interface. Also please let me know ssl will auto renew as for now showing exp in Dec , I already run auto renew commands . Hi Ved – the auto-renew command will only execute if the certificates are set to expire within 30 days. You can set up the certificates to auto-renew by following this tutorial here. I’m getting a HTTP Error 500. When I restart everything goes smooth, syntax is ok too. Is my DNS configured correctly? Does the IP address of my VM match the IP of the A record assigned to my domain in CloudDNS? For both Bitnami and Click-to-deploy, I would also check the other log files to see if you can find any traces of the error. Also – for Bitnami – check out this troubleshooting guide. Lastly, check out Stackoverflow for additional resources. Thanks Joe, I’m gonna keep looking for a solution. I don’t see anything unusual in those log files. Please keep me posted as to whether you’re able to find a solution. The example.com certificate is the ‘placeholder’ certificate. This means that you likely didn’t add the new SSL certificate file paths to your bitnami.conf or wordpress.conf file (depending on if you’re using Bitnami or Click-to-deploy, respectively). I would go back to the step in the tutorial where you add the certificate file paths to the .conf file, and make sure that your syntax is correct. You need to restart Apache after finishing with the renew process. After syntax is ok I am getting all this msg is it fine or something have gone wrong ?? This site has saved me the most important thing I have in life besides my family… My Time! This site is a gold mine of time saving info. Very Much appreciated! Glad to hear it, Jeremy – thanks for the feedback! Great Tutorial! I didn’t know how to get the green lock icon. You fixed all my problems! Thank you for taking the time to share your knowledge. Glad to hear it – thanks for the feedback Ronnie! I love your tutorials. But I may have messed up a step or two. The SSl server Test tells me that there is a Name Mismatch. How can I correct this? I will take a look if you either send me your domain name or copy and paste the message that the SSL test is showing. I just started the tutorial over and was able to get it working. Now, I have another domain that will be directed to the one where I installed the Cerbot SSl. Can I add the SSl certificate to that domain too ? If you’re simply forwarding the domain, you can do that at your domain name provider and don’t have to configure SSL. If you’re trying to serve your website’s pages from the other domain, you will indeed have to configure SSL for that domain. I got this message when trying to restart apache server. Check out these instructions that I sent to Cierra for instructions on how to fix this problem. Thanks Leron for your reply. I think I duplicated many certbots for the same domain. I tried to delete it, but I can’t find it the directory. Now I can’t even fix it although trying to follow your earlier instruction sent to Cierra. Really appreciated for your help. In both of the tutorials, the Certbot installations are located in your home directory. You can view them by executing the cd command immediately after connecting to SSH. Hope this information is helpful, and let me know if you have any questions! Unfortunately there is no way to bypass this. Check out this page for additional information about the rate limits, such as how long you have to wait before they expire. I couldn’t find certbot this /etc/letsencrypt/. Hi Leron, thank you for these tutorials. They are super helpful. I’m stuck on figuring out how to get the green SSL padlock. After going through several things to try and fix, it’s still not showing the green padlock. The site is drycreeklake.com. It appears to be a simple ‘mixed content’ error. I go over ‘mixed content’ errors and how to fix them in step 1 of this tutorial. Hello, i could not get the green secure text, i made all the steps, i’ve found out that there seems to be mixed content, but when i try to fix the route of the images they seems to be okay in my wordpress settings. Cant find out how to fix it. Check out this comment that I just posted for Jonathan here. One of the things I talk about is changing your domain URLs and changing the permalink format to post-name in order to ‘reset’ your URLs. If neither of the solutions that I proposed to Jonathan work properly, the other thing that you can do is to run an SQL query in phpMyAdmin to find and replace all of your old URLs from your IP into your domain name. Let me know if you’re able to get the problem resolved. I cannot access the website since the same issue occures there, please what can I do to resolve this issue ? Could you tell me more about the error that you’re seeing? Are you also seeing this error when you visit onepagezen.com? Also, there doesn’t appear to be an issue with your SSL for doumer.me – so I’m not sure what the issue is. I don’t see it on onepagezen.com, sorry I meant to say It appears also when I go to https://community.letsencrypt.org/ to find a solution to the issue. Please do you have any advice ? Your browser is likely showing you a cached version of the page with improperly configured certificates. I don’t see any errors when I view your page in Chrome, and your SSL is showing as being properly configured here. So don’t worry about it. I still have the privacy error, and I don’t know why, a few people told me they experience that error too when visiting my site. This server could not prove that it is doumer.me; its security certificate is not trusted by your computer’s operating system. This may be caused by a misconfiguration or an attacker intercepting your connection. I don’t see any problems with your SSL configuration. I tested in in Edge, Chrome, and Firefox – and none of them showed any errors with your SSL certificates. As I mentioned before, this is likely a cache issue with your web browser, which is still loading the old certificates instead of the new ones. Try using a Proxy service to view your website in order to bypass your browser’s behavior of displaying the cached version of the page. Firstly, Thanks For Helping Newbie’s like me With Your Tutorials. There is a syntax error on line 9 of your bitnami.conf file, on the line with ServerAlias. I would recommend going back through the tutorial and checking for errors (see step 6). But able to redirect on https://www. Www after instalation ssl . Your redirect to www appears to be working fine and your certificates appear to have been configured correctly. Hey Leron, thanks for all tutorial about gcp configuration..
about https problem “not scure” on address bar happen to me..
I’ve 2 domain installed wordpress in 1 instace on my GCP cloud. 5. update wordpress URL and then https://domain1.com works well with green secure in address bar. 5. update wordpress URL and then https://domain2.com works well with green secure in address bar but not automaticly resdirect when I only type domain2.com. must type https://domain2.com manually, green secure appeared. 6. After installed letsencrypt on domain2.com . When I access domain1.com, automaticly redirect to https://domain1.com with red “not secure” on address bar. This is not the correct way to install 2 domains on 1 VM instance. http://35.185.146.114 brings http://www.lamicane.com with ssl enable while entering http://www.lamicane.com won’t show ssl. You need to configure the redirects in your bitnami.conf or wordpress.conf or htaccess file – depending on which stack you’re using. I go through these steps in each SSL tutorial (step 6 for Bitnami). If your DNS and redirects are configured properly, your site will automatically redirect to the https version of the site when you try to access it via external IP. So I would retrace your steps through the SSL tutorial and domain name configuration tutorial and make sure you’ve configured everything properly. Thanks Joe, it is now working. Does this work with cloudflare? I have my site on it and I’m trying to run this but unfortunately I just get a bunch of redirect errors. To use the CloudFlare CDN you have to use their nameservers, which involves additional configuration that I don’t cover in any of my tutorials. That being said, I think CloudFlare offers their own SSL solution (as a plugin) that might be worth looking into. As I mentioned before, configuring your website with CloudFlare is easier said than done, and unfortunately I don’t offer support on the subject. If you’re able to get it working, let me know how it goes – I would love to hear about it! 1st of all thanks for the great tutorial. here i am also facing issue while adding cloudfare too add in google domain. previously i am using godaddy hosting with cloudfare but now i am moving google cloud. by updating google name servers in cloudfare dash board will run my flow smoothly or will face any problem please help me out from this situation. presently using cloud fare name servers here. If you change your Clouflare nameservers to Google your website will break. To use Cloudflare you must use their nameservers. this is only 302 redirection, how can I make it 301.
this also causing multiple redirections . 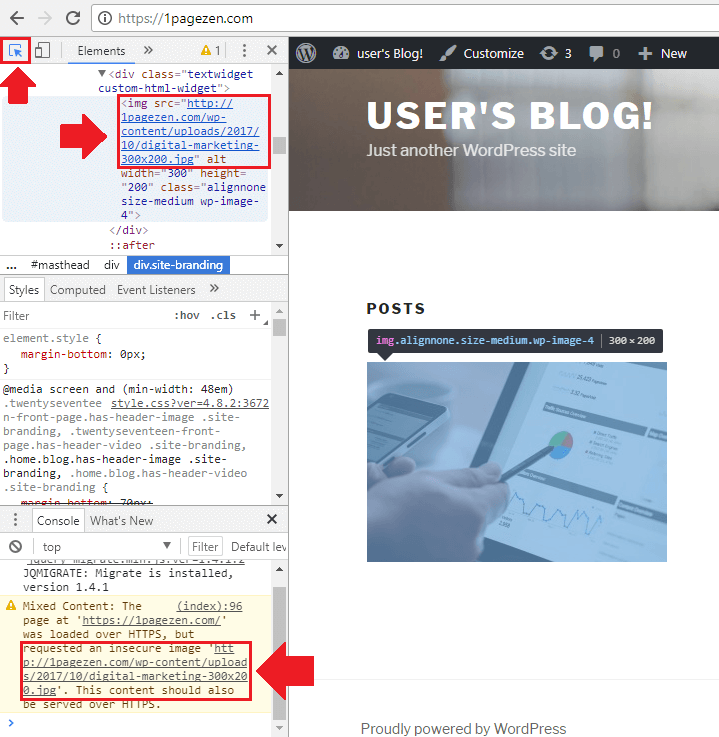 example: when I type http://onepagezen.com first its redirecting to https://www.onepagezen.com and then to https://onepagezen.com. problem 2: My website is accessible by both IP address and domain. Please give the code that sovles both the issues. after going through all the steps at the end I am getting this error when I am doing the restart command. This issue means that there is something wrong in one of your configuration files, probably a syntax error. Either one of those commands should display an output that shows which file contains the error. Fixed…. now I’m running into an issue with WP Muli-site. Can I generate the certificate for 3 different domains and it will work? Yes – you can generate a single certificate and list all 3 of the domains in the certificate, including their www. and non-www. variations. this is what I am getting after using the restart apache 2 command. I have that same problem but no yet be able to solve yet. Did you happen to find out any solution? My main website – Premium theme and plugins are sort of jammed. I can’t register a plugin and nearly all plugins and theme are not functioning. I wanted to know if there’s a solution for this ‘freeze’ from your end? I’ve managed to deactivate and reactivate one by one, including my theme but to no avail. Not sure what’s causing it. It’s not on maintenance mode since I’m able to still login and do my bit, but it’s sort of stuck now. But now don’t know the path to it… duh? I see now it’s got worse… something is definitely triggering it not to work now. Ugh!! Any help will be great… I’m still browsing through the web for answers too. Thanks. The ServerName and ServerAlias directives are only compatible with the newer releases of Apache, so I would stick with using the rewrite engine. This could very well have caused the problem. Then inside my WordPress admin I activated the default WordPress ‘theme’ too. Downloaded current WordPress from wordpress.org to my computer desktop and unzipped it. Inside my WordPress admin I reactivated each plugin and tested it one by one to make sure it worked, and deactivated the ones I that had error messages (I’ve contacted x2 the plugin developers for paid versions) but deleted the remainder duds. Also activated the premium WordPress ‘theme’ as well. Thanks for breaking it down step-by-step; I know that a lot of users (including myself) will find this information very useful. Also, which plugins were causing the issue (if you don’t mind me asking). Hopefully I’ll be able to avoid them in the future.. When trying to [Upgrade plugin], I was getting the ‘Sorry, you are not allowed to access this page.’ error. So this was the status inside… cut story short. Current WordPress updates have really clamped down on security issues. So if you have any WordPress themes or plugins that do not update regularly as far back as a month, expect it to cause issues. 😉 Test all and make sure they are in fact working. So, I use Envanto marketplace with geeky stuff. Research for top reviews and ‘team’ support – Brainforce for example. Interesting mention about the plugins that offer lifetime support, but then don’t offer updates. It sounds like a deceptive business practice, but understandable, especially for low-level plugin authors with limited resources. Fortunately I don’t use any of the plugins that you mentioned, but I could see how the PayPal plugin not working could be a serious issue. sir i used click to deploy method to host my website on google cloud and i has followed all the steps you said and everything worked and now i am getting 2 problems. 1. when i try to open my wp admin ( http://indiamoveon.com/wp-admin it automatically become http://indiamoveon.comwpadmin) , http://indiamoveon.com/robots.tx turn to http://indiamoveon.comrobots.txt…these are errors and ( / )symbol automatically vanish everytime. 2.https://www.onepagezen.com/domain-name-configuration-wordpress-google-cloud/ , as i used click to deploy method and how i will configure domain name. Thank you so much for your wonderful tutorials.I managed to install an ssl certificate after following the instructions in your tutorial. I am glad you were able to successfully install the SSL certificates! Thanks for leaving a comment, and feel free to reach out if you have any questions in the future. don’t we need to make changes to default ssl files under “/etc/apache2/sites-available”? My DNS is not getting resolved in some browsers. I looked at your SSL at it appears to be configured properly. Which browsers are you having issues with? Yes i followed the version 4 of your SSL tutorial. It is now configured properly. However the problem still persists. On Safari and Mozilla they give an error “Server Not Found”. However when i switch to cellular network it is accessible everywhere. Is this my ISP’s issue? I tested on Mozilla and Safari and didn’t encounter any issues. There is a very unlikely chance this issue has to do with your DNS configuration, but more than likely it has to do with your ISP. Yep it does. Thank you so much! Thank you for your response, i am facing constant complains from many people experienced Security Warning issue while accessing non-www and it was not auto-directing. Though everything is perfect & Fine. The best practice is to issue the SSL certificates for both the non-www and www versions of your domain, but to only use either the www-version or the non-www version as your preferred domain. What was the command that you ran that caused the error? You can copy and paste it here and I will let you know if I notice any errors. Also include a link to the SSL tutorial that you are using. Copy and paste the output in a reply to this comment. Thanks for confirming that – everything looks fine. From what I understand, it is likely a DNS issue. Check these resources for more information, and see if you can find a solution to the problem; there could be several causes. If you can’t find the solution to the problem in these threads, let me know and I will help you through it. thanks for your resource links , but i am still unable to find any solution. 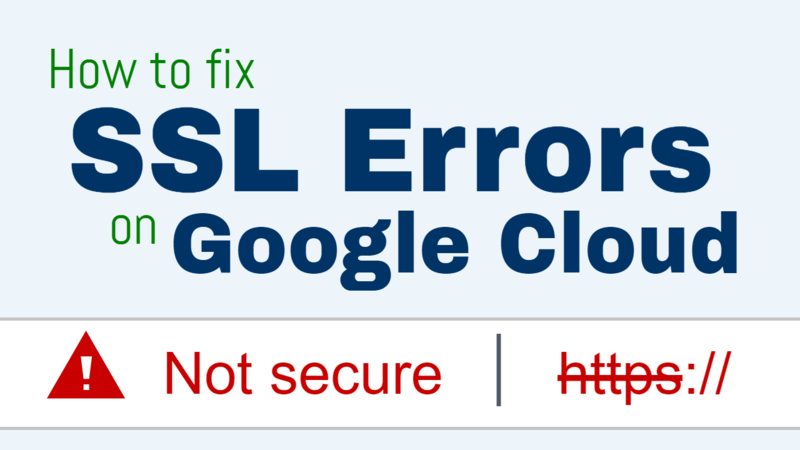 And i am clueless now to resolve this ssl error. It appears you may have been successful in re-issuing the certificates based on this. The only issue now is that your certificates are issued twice for the www-version of justladies.co. So have you been able to re-generate the certificates? Because I don’t remember there being the mismatch error the first time I looked up your certificates. Thank you Joe , its working fine now – I regenerated , i dunno what was happening even it was not re-generating ……… however, everything worked out . Thank you for your great support & Response. I am glad that you were able to get it working; I guess your persistence paid off! I am also glad that I was able to be of service! You are doing great job and keep it up. I have installed ssl perfectly but it got installed on https://www.justladies.co , whenever someone access site https://justladies.co they got security error due to mismatch name. Please help me to resolve this issue on Google Cloud. Your website seems to be auto-directing to the www-version of your site, so it doesn’t matter that the non-www version of your site (justladies.co) isn’t listed in the certificate. If you want the non-www version of your site to load securely for some reason, you will need to re-issue the certificates and include the non-www version of your site as an alias in the certificate issuing command.